WINM has announced that it has recently partnered with Seth A. Leeb Architect of Parsippany New Jersey to redesign their website, increase their web presence rankings and implement a digital brand marketing program for the organization. The new Seth A. Leeb Architect website can be viewed at https://leeb-architecture.com. Mr. Leeb’s original website was not visually compelling and had absolutely no optimization for search. 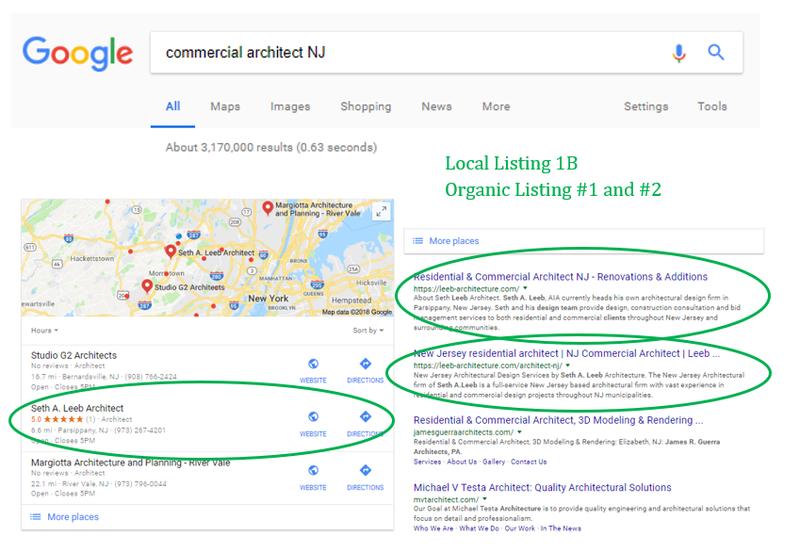 WINM was engaged to do the web design and implementation, as well as provide all the copywriting and SEO operations for that would drive both residential and commercial architecture projects in New Jersey. WINM reviewed and did extensive background research on the Architectural industry as well as the current trends in commercial architecture and residential architecture to come up with the visual concept of the new Seth A. Leeb Architect website. The marketing program that WINM has implemented for Seth A. Leeb Architect includes organic Search Engine Optimization, content marketing and Social Media advertising. WINM’s SEO Program will also produce quality blog, graphic, social media and video content to syndicate on external web properties including WordPress, Weebly and Blogspot in addition to several other WINM proprietary content distribution platforms. In a NYC suburb area crowded with freelance architect’s, Seth Leeb’s website stands out. A tally taken only 3 months after start of the program indicates Mr Leeb has had over a dozen requests for new bids and has closed business worth well over $100K. We expect we will only go up from here. For those looking to see what a truly personalized marketing solution looks like, why not give WINM a call today? WINM announces that it has recently been awarded the contract to introduce HomeWorks by United Methodist Communities, an in-home senior care service covering central New Jersey. The initiative is part of the United Methodist Communities continuing non-profit mission to bring the finest care and support to senior citizens throughout the state. WINM designed and implemented http://www.homeworks.umcommunities.org as the backbone of the new marketing effort to expose the home health aid service to seniors and their families. The website retains the branding of the main corporate site at http://www.umcommunities.org but expands and the type of services provided by the brand as well as their unique non-profit mission. WINM was engaged to do the web design and implementation, as well a provide all the copywriting and SEO operations for the new business initiative. WINM engaged in a detailed business analysis with its UMC partners and produced substrategies for a number of the most unique aspects of the UMC offering. These marketing treatments seek to differentiate UMC HomeWorks services in a crowded New Jersey home health aide market. This business discussion informed extremely detailed Search Term research across specific NJ counties and towns. As a result WINM created SEO optimized page content on a number of topics which marry searcher’s intent to the unique service offering of the brand. Through its elite regional branding program, WINM customized a content strategy for HomeWorks through on-page and off-page activities. Using our unique and proprietary techniques of Search Engine Optimization, WINM conducted an in-depth keyword study in order to better understand how customers search for terms related to the home health care industry in NJ. These key search terms were then correlated into the website through strategically written web copy. WINM’s SEO Program will also produce quality blog, graphic, social media and video content to syndicate on external web properties including Tumblr, WordPress, and Weebly and Blogspot in addition to several other WINM proprietary content distribution platforms. No one has more experience in creating a digital brand than WINM. If you are contemplating a rebrand of your company or franchised business, you owe it to yourself to call us today. WINM consulted on the re-design and development of the Air Charters Inc new website, and constructed a broad national marketing program, which is geared towards executive and private travelers looking to charter private planes for their travel needs or wanting to have their private jets operations managed by a third party. The program is designed to create awareness on the time saving and convenient advantages of private jet charter for busy business executives as well as for individuals looking for private specialty travel. Through its elite national branding program, WINM customized a content strategy for Air Charters through on-page and off-page activities. Using our unique and proprietary techniques of Search Engine Optimization, WINM conducted an in-depth keyword study in order to better understand how customers search for terms related to private jet rental. These key search terms were then correlated into the website through strategically written web copy. WINM’s National SEO Program will also produce quality blog, graphic, social media and video content to syndicate on external web properties including Tumblr, WordPress, Blogger, and Weebly in addition to several other proprietary content distribution platforms. WINM, the world’s largest internet marketing company, announces it has partnered with Kuehn Bevel, (http://www.kuehnbevel.com) America’s leading manufacturer of decorative bevel edge molding and the source for high-quality decorative countertop edge products in laminate, solid surface and wood. WINM consulted on the re-design and development of Kuehn Bevel’s new website, and constructed a broad national marketing program, which is focused both consumers and countertop fabricators. The program is designed to bring new life to the laminate countertop industry and continue to build brand recognition for Kuehn Bevel. Through its elite national branding program, WINM customized a content strategy for Kuehn Bevel through on-page and off-page activities. Using our unique and proprietary techniques of Search Engine Optimization, WINM conducted an in-depth keyword study in order to better understand how customers search for terms related to laminate countertop edge options. These key search terms were then correlated into the website through strategically written web copy. WINM’s National SEO Program will also produce quality blog, graphic, social media and video content to syndicate on external web properties including Tumblr, WordPress, and Weebly in addition to several other content distribution platforms. For further details on WINM’s capabilities and strategies around SEO, SEM, Paid Search, and online marketing opportunities in general, please contact us for a free marketing analysis and consultation. WINM announces that it has recently been awarded the contract to complete the digital rebranding of United Methodist Communities, a non-profit group of New Jersey assisted living communities and senior housing communities across the state. For 109 years, United Methodist Homes has been a leading provider of senior living and care with 10 locations across New Jersey serving thousands of adults. Over that time the brand has grown and expanded its charter to reflect the needs of its communities, residents and families. In a major rebranding activity the organization has changed its name to United Methodist Communities and adopted the tagline, “Abundant Life for Seniors”. Determine a careful redirect strategy that preserves most of the domain authority achieved through the old domain SEO programs. The WINM approach is characterized by careful attention to detail and proactive engagement with the client and staff to create a real team oriented rebranding activity.